It took us 6 days to travel from Tok to Dawson City. A trip many RV'ers make in one day. If I had to make this drive in one or even two days, I would have very unpleasant memories of the drive. In the previous blog entry we ended our travels at a pullout on the Taylor Hwy at MM28 about half way between Tok and Chicken. After a quiet night at the pullout we continued on towards Chicken. .
Info and sights along Taylor Hwy. The road from Tok to Chicken is paved up until about 2 miles from Chicken. These two miles are the bumpiest part of the gravel road from here to Dawson, YT. Chicken, AK was a large mining area, turned into a tourist attraction in modern times. Chicken consists of three private businesses, each with some sort of camping area, a store and restaurant or place to eat. We had kind of planned on staying in Chicken, but after getting there, we decided it was more touristy than we cared for, so we moved on. “Downtown Chicken” is the most interesting of the three. This is supposed to be the “original” business in Chicken. Owned and run by a lady who bakes a lot of goodies every day. I saw some really good looking cookies, about 3”-3/12” in diameter, however they wanted $3.50 apiece, so I passed. There is free RV parking for up to 2 nights. However the little circle to park in is very unlevel and tight to turn around in. We arrived I went in the store to ask about camping and was warned to be careful if we drove though the camping area. A diesel pusher got stuck in there a few days ago. The dips in the gravel are so deep the rear bumper will drag. Well, we were already part way in and had the truck still attached. I made the U turn to get out OK, but my rear drag bars drug on the ground pretty good. And we are only 29' long. We didn't stay. The only side of the area could we have leveled the RV on was right next to their large diesel generator. “Chicken Gold Camp” was nicer and had an actual RV park. $16 for about 6-8 dry campsites and about 40 or so elect sites for $18 I think. I thought about staying, but the office staff told me they only had 1 or 2 dry sites available since they had two caravans coming in today. There is an old gold dredge here to look at. This is the nicest of the three places. The third business, “Town of Chicken” appears to be kind of a rip off place. $40 FHU, $20 dry camp. 10% off RV sites with fill up. However their gas prices are 10c gallon higher than Downtown Chicken at $3.44/gallon. Before we left we did fill up with gas at Downtown Chicken. Even at $3.44/gallon this is cheaper than what we will have to pay in Canada. About 10-15 miles from Chicken is a nice little BLM CG, Walker Fork. While it is nice, it is in the bottom of a canyon with no view, so we continued on. The gravel part of Taylor Hwy was in very good condition. In spite of what the pictures below may look like, there was plenty of room for oncoming vehicles to pass. As long as you drove slowly and carefully. Better yet, if one vehicle stops to allow the other to pass. Unless the road was exceptionally wide we stopped and let the other vehicle pass us. What you don’t want to have happen. I am guessing someone got too close to the edge and slipped off. Perhaps because of oncoming traffic. Go slow and perhaps pull to the right and stop for oncoming traffic. We didn’t see the RV stuck in the picture above. I found the picture on the internet. This is a typical view of what the road from Chicken, AK to Dawson City, YT looks like. Side trip to Eagle, AK. The Taylor Hwy goes from the Alaska Hwy near Tok, to Eagle, AK. At about mile 96 on the Taylor Hwy there is a large "Y" intersection. 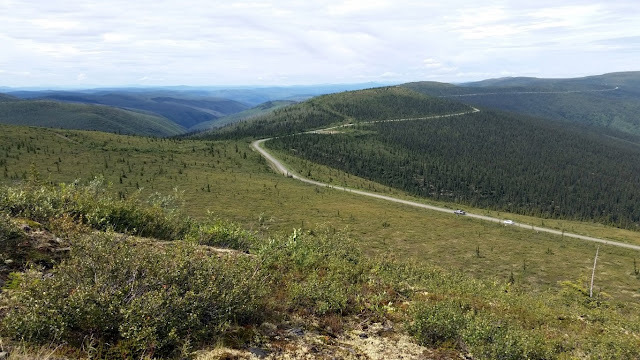 The Boundary Rd continues straight for about 6 miles to the Canadian (Yukon) Border while the Taylor Hwy heads about 60 miles almost due north to Eagle. I wanted to visit Eagle, but again, not being sure of the road condition I didn’t want to drive the motorhome. Also my research didn’t show enough to do and see in Eagle to spend three nights or more there. Driving 60 miles of gravel road, no matter how good the road is, for an overnight or two night stay is not something I will usually do. There was one other RV parked here. A small travel trailer about 100 yards from where we parked. All was nice and quiet until the guy came back to his trailer and cranked up his small contractor generator. Even though we were inside the RV with all the windows closed we could easily hear the generator. Ah, well, you can’t have everything. He ran the generator until about 10pm. We had rain most of the night, stopping some time after 3am. When I got up at 5am, I could see fog in all the low lying areas to the east. By 5:30 the fog started rolling in. By then I pretty much decided we would not drive to Eagle today, but just stay in the RV and wait for better weather. However by 6:30am I could see more or less clear sky looking up through the clouds. So off to Eagle we went, leaving about 6:55am. The road to Eagle was suitable for any rig up to about 35’ long. There are some blind curves to watch out for, but if you look far ahead, well before reaching the blind curves,you can see the road for over a 1/4 mile to see if there is oncoming traffic. I had hoped to make it to Eagle in time for the 9am walking tour of town, but it took us a little more than 2 hours for the 60 mile drive. We went directly to the National Forest visitor center for information and talked to a very nice seasonal ranger, Randy Smith, probably about 50’ish. He lives in Eagle year around. I think he said he was born here, or moved here with his parents as a youngster. Randy told us about the ice dam which formed just down river on the Yukon and dammed up the ice which pushed into parts of the town destroying several buildings. The visitor center has a 15-20 minute video of the ice backing up and flooding the town. Very interesting. Ask for the video if you go to Eagle. It is an amateur video, shot with a hand held camera. Nothing professional, but very informative and interesting. A photo of a display panel, detailing the ice dam, outside the visitor center. Here is a link to a 4 minute YouTube video about the ice dam at Eagle. Not as good as the video at the visitor center though. This is what the Yukon River looks like in the summer. It took us about 15 minutes to walk around town. Then we stopped in at the Hotel for lunch with a nice view of the river. If you do drive your RV to Eagle, there is a BLM CG about 1 mile from town, .Most campsites are pretty small. All campsites are in the trees, so probably lots of mosquitoes. It was a nice days outing and we can say we visited Eagle, AK. We had an uneventful 2.5 hour drive back to our camping spot. Our neighbor left so no loud generator tonight. The next morning we woke to dense fog which stayed around until about 3pm. I'm not sure if this was really fog, or just low clouds. Our elevation here is about 3650' so we could be just up in the clouds moving by. Of course, fog is just a cloud at ground level. I didn’t want to drive across the TOTW Hwy in the fog so we just stayed around camp today. Once the clouds lifted I went out to pick some blueberries on a hillside about ¼ mile away from camp. There are lots and lots of ripe blueberries in low bushes about 6” to 12” high. It took me about 4 minutes to lose interest in picking blueberries. Kneeling or squatting on the ground picking those tiny berries got old very quickly. I picked about 1 1/2 cups of berries and decided that was enough. My intent was to pick at least a half a gallon. Lazy I guess! Start of drive across the Top Of The World (TOTW) Hwy. The third morning, we woke to high clouds with tiny bits of blue sky seen through the clouds. Yea, hopefully this will be a nice day to drive part of the TOTW Hwy. The 8 miles of Boundary Rd from the Y junction to Eagle to the Canadian border is beautiful wide and newly paved road. Nice views of the open country side. We arrived at the customs station and had the easiest border crossing yet. 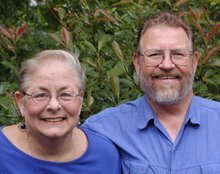 Just a few questions about guns and how much cash we had with us. A quick check of our passports and we were on our way. Within a 200 yards of the border we ran into dense fog. So much for our nice scenic drive today. Notice, in the photo above, the small potholes. 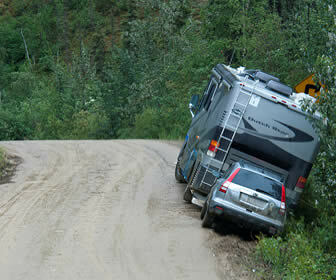 This was typical of the very few potholes we found on the road from Chicken to Dawson City. We didn’t drive far on the TOTW Hwy today. At KM 59.5 we turned off on a side road toward Clinton Creek Mines. About on mile down this road is a very nice level parking area. 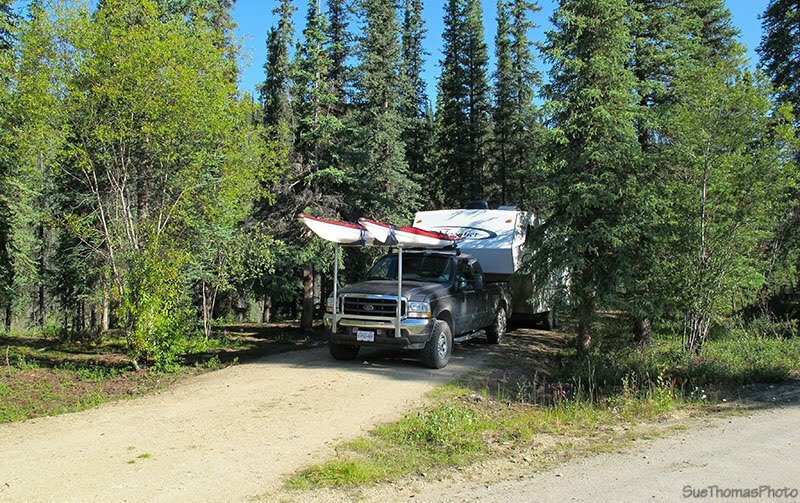 We shared the parking area with a nice man and his dog from Dawson City camping in their p/u truck with slide on camper. Also we had a nice view of the sky and hillsides from our boondocking spot. When we didn’t have clouds this is typical of the views from the TOTW Hwy. The 4th day we woke to low clouds and some fog, so we spent another day at this boondocking spot. The clouds did lift in the afternoon so we drove about 20 miles down Clinton Creek Rd to the Fortymile river. Unfortunately there were no views of the country side along the road. There is dense brush about 8-12 feet high on both sides of the road blocking the views. A view of the river from the bridge. There are ruins of the Clinton Creek mine several miles down the road across the river, but they are not accessible to the public. Info about Clinton Creek Mine here and here. The 5th day we woke to partly sunny skies and no fog. Yea! We broke camp and had a beautiful drive along the last 35 miles of the TOTW Hwy to Dawson City. The Athapaskan peoples and the caribou have lived alongside each other for thousands of years. The herd was an important source of food and shelter for the people. The once plentiful herds were hunted as they migrated north and south across this country. Spring and fall where the main hunting times. Imagine standing here for two days watching hundreds of thousands of animals cross the river below you. There are still scars in the valleys that lead to and from the river banks, left by the great herds as they climbed out of the water. Many family groups would gather for the hunt. The animals were most vulnerable as they swam across the river and climbed out onto the banks. If the hunt took place on land they would surround the herd and close in. The startled animals were easily killed by the hunters’ spears and arrows. “Caribou fences” were also used by the Athapaskan people. The fences were constructed on uphill slopes, close to timber stands for camouflage. They were designed to corral the animals for easy slaughter. Snares were set in the fence to capture those that tried to escape. The animals were skinned and butchered where they were killed. The meat needed by the village was carried back, the rest was stored in a cache near the site. People would return to collect when required. The fall hunt produced fat meat and thick hides prized for winter clothing and skin-houses. The hides were prepared with the hair on for extra warmth. The hair was worn on the inside next to the body. Summer clothes and tents had the hair removed. Each skin-house was up to 18 x 12 feet. It could house from 12-15 people. Two sections of hides covered the spruce pole framework, each section having up to forty skins. They were warm and could be assembled quickly, suiting the nomadic life style of the people. On a roadside display on the Steeze Hwy northeast of Fairbanks I read of reports of over a half a million caribou migrating past. The report stated the man watched a constant stream of caribou past for several days w/o even a break in the herd. There is a nice Territorial Park just before you take the ferry across the Yukon River to Dawson City. We drove through the CG but decided not to stay there. Several of the campsites are right on the river with pretty good views. Several of the campsites are large enough for 35'-40' rigs. Sorry no pictures. The ferry crossing is interesting. There is no permanent ferry landing. Just a gravel berm ending at the water. The ferry just noses into the gravel and you drive on or off of the ferry to the gravel. There is a bulldozer to maintain the gravel as it washes away. Instead of staying at one of the full hookup RV Parks, we opted for the low price dry camping park in the industrial area about 3 miles east of town. We stayed at “RV Off Road Park”. GPS: 64.041231 -139.376110. Behind the Quonset hut in the photo above there is a large level parking area. Not much to look at, but it was quiet. No restrooms or hookups. But the price was right at $10/night. We had the place to ourselves. 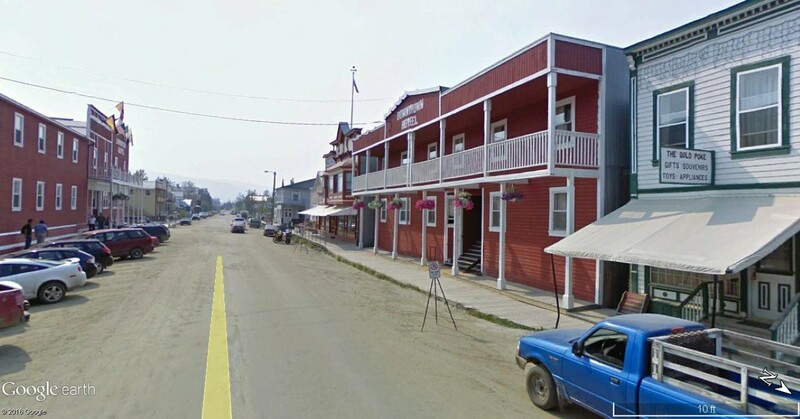 We spent two nights here visiting Dawson City. 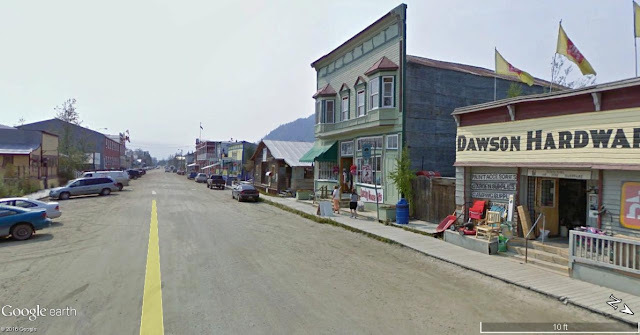 I don’t have much to say about Dawson City. A fairly nice little town. All the streets are dirt with wooden boardwalks for sidewalks. The highlights are the board walk along the Yukon River and the Dawson Museum. We spent about 3 hours visiting the museum. 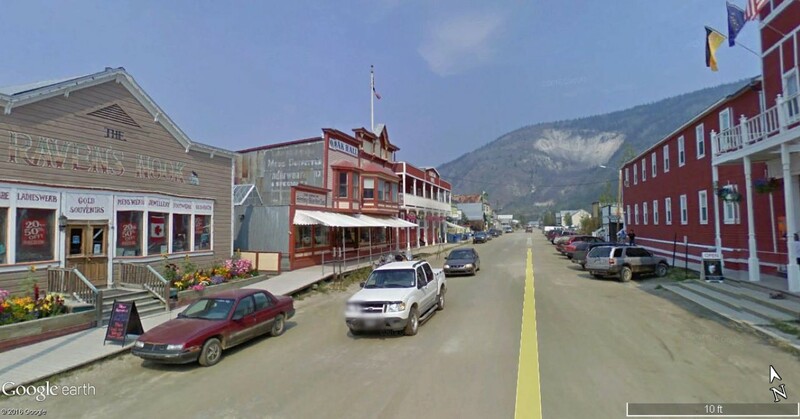 Info about Dawson City from Wikipedia. 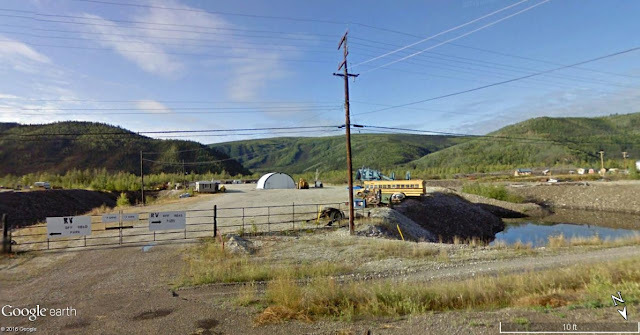 When you are in Dawson City, be sure to drive to the top of the Dome Road for great scenic views on clear days of the Yukon river and Dawson City. I didn’t get any pictures from the Dome, but go to this blog for great pictures of the views. That’s all for this part of the blog. Next up is Tombstone Territorial Park.